Our January meeting is an important part of who we are as a guild. We honour our community and those in need by contributing our talents as quilt makers to those less fortunate than ourselves, whether through health, age, or the country they were born in. Thanks go out to the CQ team of volunteers with particular note of Bev Stevens and Jan McGoey for a well planned & well organized quilting BEE. Despite inclement weather the meeting was well attended- so a shout out to the membership for your attendance! Six round tables for the applique project of sewing ‘fussy-cut’ children’s themed fabric to squares and six rectangular tables for the tying of yarn on baby quilts were the main activity hubs. Additionally, three members with sewing machines were ready to attach binding to the completed baby quilts. The evening offered members a rare opportunity to chat with one another, learning about one another’s other’s quilt journeys, frustrations, successes and preferences. A goal of friendship within our guild is a definite possibility. To add spark to the evening, there were refreshments of wonderfully-yummy cookies (that WE hadn’t had to bake) and PRIZES galore, AND sample tops from the Jan 2016 Community Quilting meeting. To fill the gap left by their previous quilter, YHQG has been able to give 32 quilts to Seven Oaks, thanks to the efforts of all who attend every Monday and those members who take home projects to complete. Seven Oaks heard about our Guild because guild member Anne Oliver, told them about our outreach programme. A quilted panel/wallhanging , shown below, will be going to the Toronto Intergenerational Partnerships in Community (TGIP) for their upcoming fundraiser April 27 2017, being held at the Toronto Estonian House. I asked Wendy Dines if she could give more insight into who YHQG Community Quilters are and what they do… here is here very insightful summary. Thanks Wendy! The number of Guild members has filled our little room at Stan Wadlow Community Centre. Last week, there were 19 around the lunch table. However, the numbers wax and wane as travel, holiday and family plans arise – in other words, when life happens! Bev Stevens has been a driving force at CQ – her mission is for CQ to ensure that when Guild members take a kit or a sandwich, they enjoy the process and the final product is something to be proud of and is beautiful. Thus the numerous colourful and colour-coordinated kits. She likes to find new patterns and prepare the kits for the CQ for members to assemble. As well, because of her Mother’s dementia, she identified a need in the larger community for the Touch Quilts – she continues to put together the kits for members to sew and herself sewed a touch quilt every week, for an entire year, in memory of her Mother. The Community Quilting Night is January is a huge group effort. We brainstorm ideas to bring different projects to the membership. Preparation entails selecting a project that will engage many people of varying skill-sets, cutting and ensuring all necessary supplies are purchased and, after the Jan meeting, finishing the projects. Members who are not able to attend the Monday meeting can contribute by working on the CQ kits & quilt sandwiches at home. Also, if you are aware of recipient organizations that would appreciate a gift of comfort quilts for their patrons OR of a charitable group that qualifies for an auction quilt for their fundraising, please bring them to my attention. 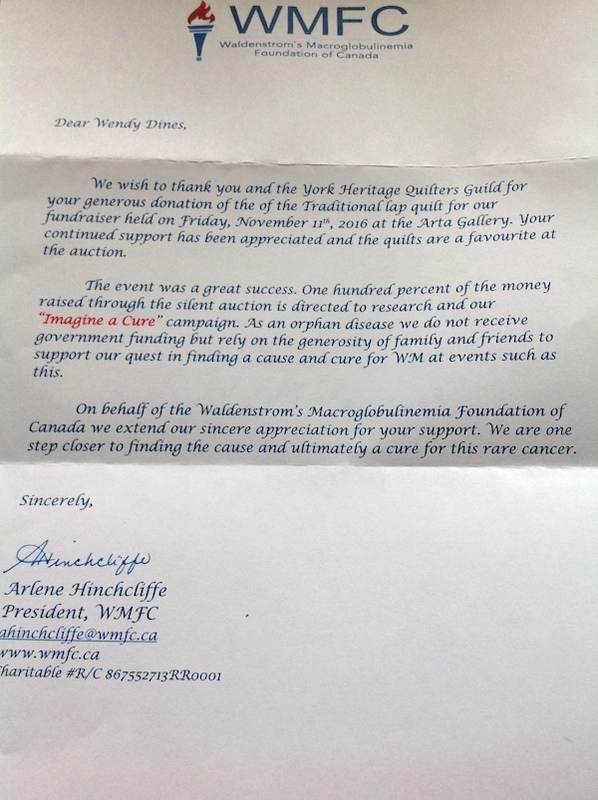 And in the spirit of giving, below is a thank you letter from the Waldenstrom’s Macroglobulinemia Foundation of Canada. Kirsten Johnston made a quilt that was donated to them, to be auctioned off for their charity. 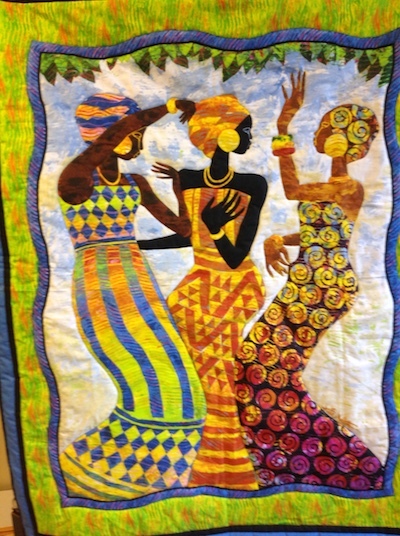 Remember, if you have a charity that could benefit from a quilt for auction, contact Wendy Dines for more information.